Things you can commonly find me doing in my room: playing with cameras, reading books, and lounging on my fluffy bed. Here I am reading short stories by Haruky Murakami and playing with my Canon rebel XS 35mm. Feeling especially whimsical in this lovely floral crown that my dear friend from Australia, Kani sent me! You can find more unique hand made crowns by her on her Etsy shop! As for these amazing pumps, they are from one of my new favorite brands, Pink & Pepper. I love that they add a quirky/edgy touch to any simple outfit. Check them out here! Hope you all are having a fantastic Tuesday! loving that dress & of course those leopard pumps!! So soft and pretty! Love everything! I absolutely love your dress and leopard heels! Such dreamy photos! I love your dress. It's so pretty. hehe no joke, I actually thought 'wow so similar to Kani's headbands!!' as soon as I saw it! amazing accessories, no?! you look so lovely! I enjoy reading in my room too. Very relaxing. Cutest mint dress! I've been loving mint so much lately! Love how you paired it with the floral crown. Oh Bonnie. Your dress is heavenly! These photos are so wonderful! The dress looks like it stepped out of a fairytale! I LOVE your floaty mint dress and comfortable pretty bed. That flower crown is stunning, will definitely have to check out her Etsy shop! lovely flowers on your head! Sweet pictures! Love the dress is very fairy tale, and going for leopard pumps such a fun idea! Great pics and of course I love the shoes! Beautiful pictures! That crown is adorable! You look so pretty, girly and retro!! Love your dress! super pumps and headband! great mix! The dress is stunning and the whole outfit is amazing! i think these are really some of my favorite photos from you yet. the set is very lovely. Gorgeous mint dress and flower crown Bonnie!! Lazy days in the bedroom are the best! Loving that camera! How adorable! You're right, those heels totally sass up your sweet little dress. where are your pillowcases from?! such an unexpected yet fabulous pairing! Adoring this photoshoot - especially the flowers in your hair. So lovely! waow.. you look so beautiful.. love your look.. I love that head piece and that dress is a lovely color! The leopard pumps were the first thing my eyes were drawn to Bonnie, they're GORGEOUS! Beautiful outdit, your room looks nice too! wonderful blog. new reader here! your room looks so cute and quirky! So lovely pics!And that dress! 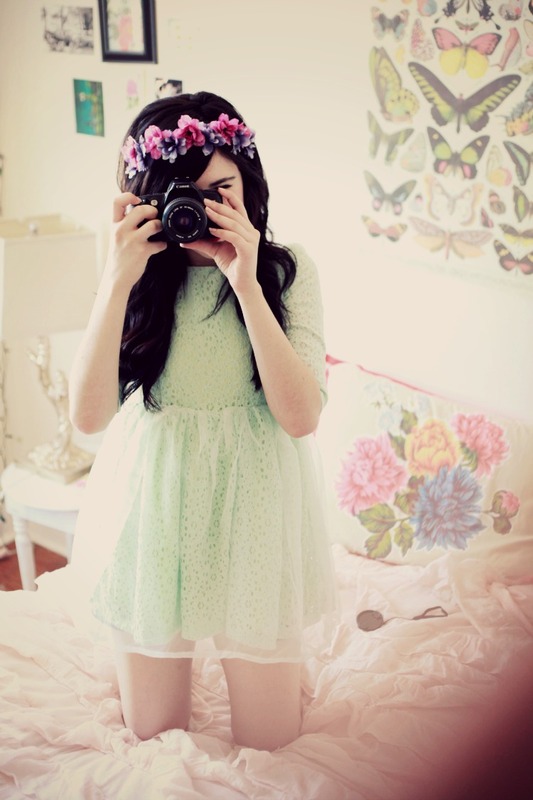 Cute dress and floral crown !!! Great style! Love the flowers on your hair! stunning photo's I really need a better camera!! this headband looks amazing on you and I love the dress, the colour is so pretty. Lovely head band, likin' the heels & socks combo. I am having serious dress envy right now haha! I've been loving mint so much and this dress is just so cute. Love the headband too - I love the stuff Kani makes. Have a lovely week! Your room is so feminine and glitzy, exactly how I imagined it! Love those heels with the socks. Unusual way to dress up animal print! So so very precious! Love that minty green dress. Your dress is so gorgeous! And your room looks so lovely as well, I've moved back home for summer and can't wait to have my own proper room again! Ah, eu adoro as suas fotos! Hi, I'm having a giveaway on my blog, maybe you would like to participate, you can do it in http://aridehome.blogspot.pt/2012/07/necklace-giveaway.html. You have such a pretty room, it matches your pretty sense of style perfectly! lovely dress... love your top as wel..
Beautiful photos of pretty look & your room! 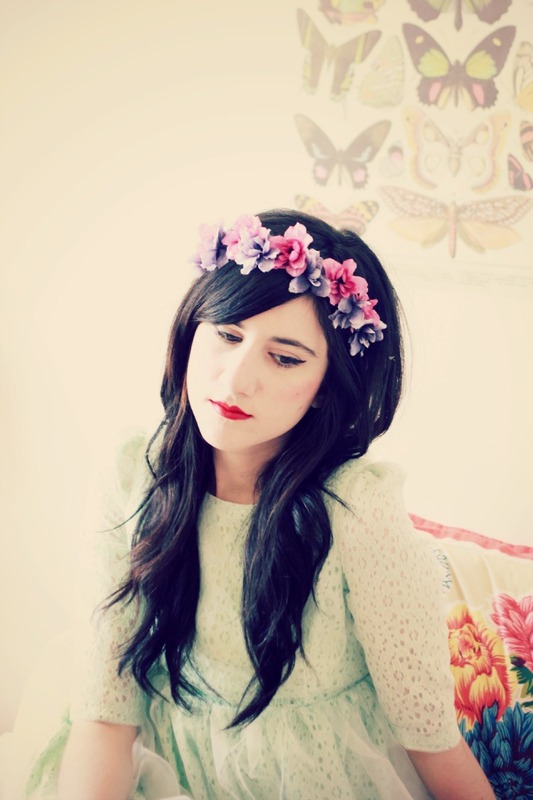 I want a floral headdress too <3 Cute. the most dreamy and fairytale-like photos I´ve ever seen! so amazing ! I really want your camera! I love the combination of colours with the lighting and mood.